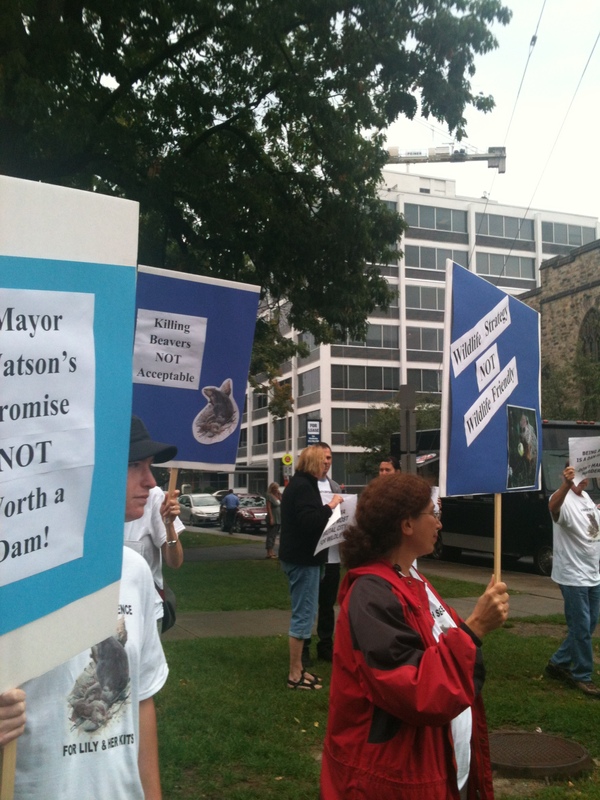 On Friday, September 14, 2012, I had the privilege of joining with a small group of concerned, dedicated citizens, who rallied together at City Hall in Ottawa, for the rights of wildlife in the Ottawa region. 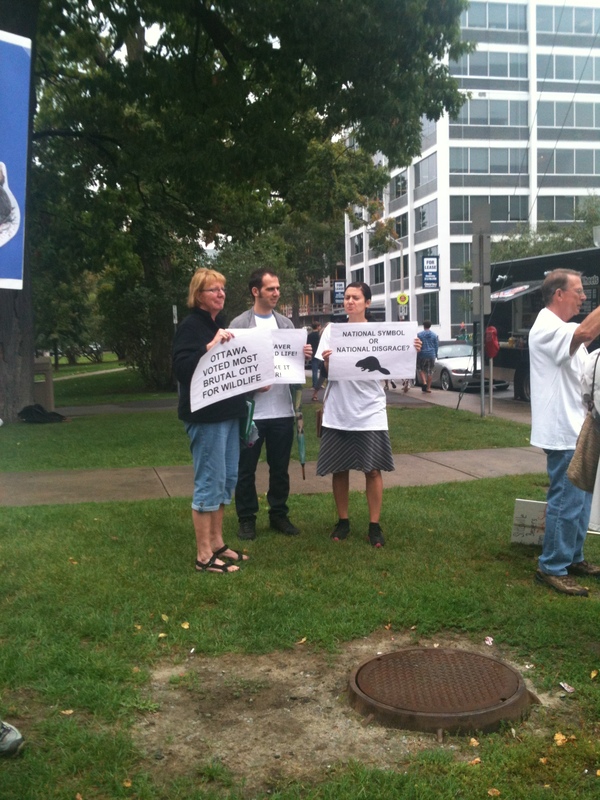 This has been an ongoing fight and with the recent, untimely relocation of a beaver family who had been residing at a Stittsville pond, the group felt the pressing need to take to the streets and inform the public of the City’s desperate need for a humane and progressive Wildlife Strategy, which had been promised by Mayor Watson and City Staff, but has not yet come to fruition. It was a great turnout, despite the rain, of about 15-20 people, all carrying signs with pertinent slogans and most wearing t-shirts depicting a local artist’s rendition of Lily and her two kits, the beaver family from Stittsville. 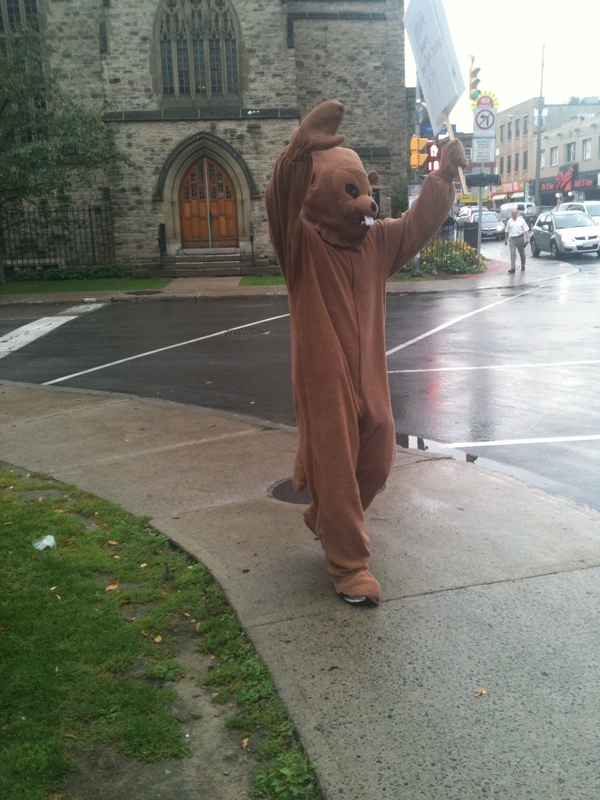 There was even a beaver mascot, who was most definitely a hit with pedestrians passing by, many stopping to hug and high five the mascot! The media showed up. CBC was there with camera rolling from the start. The Metro and The Sun arrived part way through the demonstration, interviewing several demonstrators. Links to the corresponding news stories are provided below, as well as the link to the new petition, which I’m hoping everyone will feel compelled to sign! All in all, I would say the rally was a success. We were able to reach the public, gain media attention and raise some awareness in regards to the plight of wildlife in the Ottawa region. This group of dedicated individuals continue to fight for the rights of wildlife, petitioning the Mayor and City Staff to abide by their promise to devise a Wildlife Strategy that is humane, progressive and respectful of ALL wildlife. Let’s hope the Mayor will step up and honour his promise. Thanks so much for writing about this important issue, Liz. I hope more people will learn the truth about what has been happening to wildlife in our cities, and take action to help! My pleasure Anita! It is my hope as well, that by writing and speaking out for wildlife, that others will follow and do the same. The more voices the better!